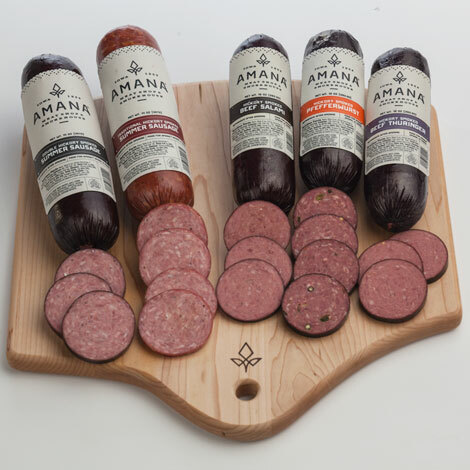 Truly for the sausage lover, enjoy five different Amana sausages in one great flavorful pack. It's sure to surpass your expectations. One of most popular items! Wonderful shipping and amazing meats. This is something I used to get at my Grandmother's so it is something nostalgic for me!! DELICIOUS. I grew up in Iowa and nothing beats Amana meats. I ordered the 5 pack of the different sausages and what a hit for Christmas gifts! Everyone loved the varieties and the fact that they came from Amana Meats! I also added the beef sticks to add to their Christmas stockings, so if your looking for a great gift idea, just head to the Amana Meats website! Your Sausage 5 pack is a great value with 5 different superb sausages. Have enjoyed each and everyone (especially with some Wisconsin cheese and some good red wine)! 5 start purchase every time! Always super fast shipping. Very friendly service! Amana is a great place to buy Holiday gifts. The service is prompt and reasonable. The products are excellent. I cannot resist buying the package of sausages. My guest always enjoy the different kinds. This was the best sausage and meat combo box. We orderedit for my husband birthday and he loves it. A great gift for the guy that is hard to buy for. I highly recommend it. Amana Meat Shop is wonderful. They delivery on time without any hassles and are easy to work with when an order needs to be changed. The quality products are delicious and always well received. You can count on them to make any gift remarkable. 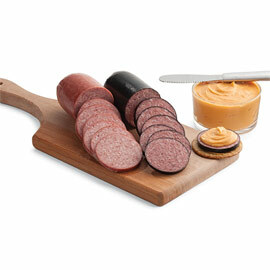 Purchased some summer sausage this summer and enjoyed it greatly. Had to order the five sausage package and am enjoying them also. Best sausages i have had in quite some time. What a wonderful taste medley. I love these and they are always fresh, tasty and a welcome snack. Will be buying this again and again. Love it! The package I sent had 5 summer sausage in it, and an add on of cheese curds. Shipped from Iowa to Idaho during the hot months. I was told by the receiver that it arrived in good shape, the ice pack was melted by the time it got there and things were ok. I think if I were to do this again I might ask if they would include 2 ice packs, I think that would work better even though it was two day shipping. The people who received this package as a gift thought it was very good, and tasted great. I give 4 out of 5 stars because product was as expected, shipping was high, and I thought it needed more ice to go that far. Amana Response: Thanks for your feedback and letting us know. It is hard to get items from Iowa to Idaho with the ice still frozen in the hot months. The good news is that all the sausages in the Sausage Five Pack are shelf stable and do not require any ice packs. Your including 2 ice packs is a good idea. We'll try that along with some other ideas for shipping in the hot months we are testing. We are always looking for ways to improve and appreciate your taking the time to help. So glad your recipients are enjoying their gift! 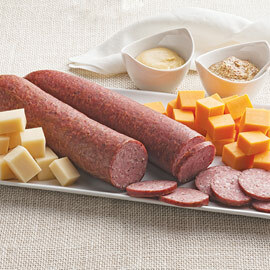 Bought this for my husband for his birthday as he is an avid lover of meat and cheese for snacks. He loved it. The meat was delish and it was nice having a variety. I will purchase again next year, possibly sooner...it was really good. Awesome tasting. Great variety. Good value. Will definitely be back for more! Boght a variety pack as Christmas presents. Everyone loved them. Received them quickly and boxed nicely. We order this as a gift for my in laws at Christmas. They love to share it with friends. Great assortment, great deal with ample products, fantastic flavor! What else is there to say! OUTSTANDING SERVICE AS ALWAYS. ALWAYS ON TIME EVERYTIME WE HAVE REQUESTED AN ORDER OF MEAT PRODUCTS. Thank you. The gift was enjoyed and appreciated. The recipients have raved about the order and were very, very pleased with everything. Sent this pack to my parents and they love it! I ordered this as a gift for my Dad for Father's Day. He was very impressed with the size of the sausages...and then he tried each one of them...he was VERY happy with the freshness and flavor of each one. I was able to try them as well a week or so later and they were all excellent. I would purchase this set again and try other products from Amana as well. I order these for our clients as a Christmas gift and they raved about how good they were. definitely a big hit! Ordered the sausage collection for Father's Day. It arrived as promised and my 96 year old father was very happy with his sausage. He is first generation American and grew up n German and Polish sausage. He loves gift boxes from Amana! As expected, good stuff and great gift. I have purchased this before. It is going to be a gift to my Nephew's that are coming for Christmas. My guests devoured these sausages at Thanksgiving. I had to order another pack for Christmas! No cooking is required. Just slice and eat with crackers, or in a sandwich. Refrigerate after opening.